What Does Facial Rejuvenation Mean? The term “rejuvenate” means to make someone or something look or feel better, younger or more vital. In today’s aesthetic industry, facial rejuvenation refers to the multitude of procedures and treatments that claim to restore youthful facial features. If you’re interested in facial rejuvenation, finding a skilled and knowledgeable provider like the ones at Celibre Medical can help you prioritize what’s most important to you. Maybe you have facial discoloration (red or brown), or you want to reduce your pore size or tighten your skin? Perhaps you want to reduce the appearance of the lines and wrinkles? Or maybe it’s some old acne scars that are bothering you. Whatever is bothering you, we have an option. We like to refer to the four “R’s” of rejuvenation: Relaxing, Refilling, Resurfacing and Removal. We believe that your specific combination of treatments and/or procedures should focus on these four goals for you to truly achieve facial rejuvenation. With the help of injections of Botox or Dysport we can soften or even remove your fine lines and wrinkles. Repeated contraction of your facial muscles can trigger unwanted lines and wrinkles at the sides of your eyes, your mouth, forehead or between the eyebrows. These injections relax overactive muscles to restore a smoother, rested appearance. We also use Botox to relax overactive muscles in your chin and at the corners of your mouth. Though not widely used, these techniques for the lower face can transform and smooth your chin and turn the edges of your mouth upwards helping you look younger and with just the hint of a smile. We use dermal filler injections of products such as Restylane, Restylane Lyft, Juvederm (all hyaluronic acid-based fillers) as well as Radiesse and Sculptra to reshape your facial features and fill in specific fine lines and wrinkles. These products have a much different capability than Botox or Dysport and are not interchangeable. Dermal fillers are used to redefine your lips, restore lost lip volume, and plump the apples of your cheeks. If you’ve noticed folds forming at the sides of your mouth or chin (marionette lines), these products are an excellent choice to smooth those as well. Lastly, dermal fillers can smooth the transition area between your lower eyelid and upper cheek. This is known as the “tear trough” and filling this area can make you look much less tired and reduce the appearance of small bags and under-eye circles. 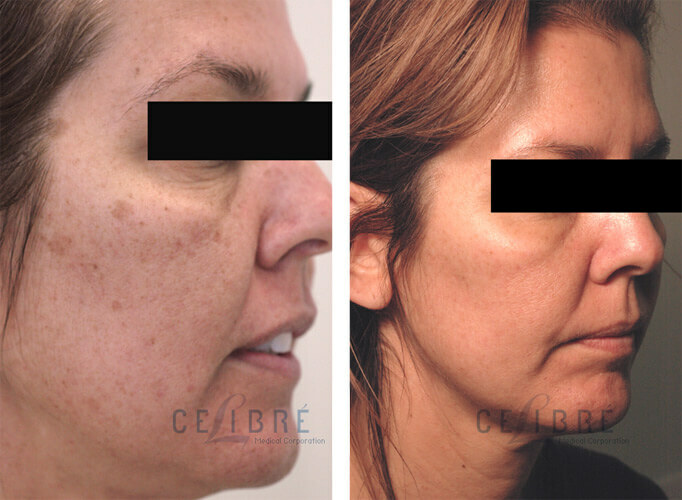 At Celibre Medical, we use laser resurfacing technology to achieve lasting improvements with the texture of the skin. Rather than light peels or microdermabrasions, we utilize our Sciton Profractional laser to improve revive tired and dull outer layers of the skin while stimulating collagen production deep in the skin. This “R” focuses on getting rid of the brown and/or red discoloration that appears so commonly as we age. For brown spots, our q-switched laser and Sciton BBL work quickly and effortlessly to remove sun spots, freckles, birthmarks and more. If you have redness, broken capillaries or other red spots on your skin, we have two vascular lasers ready to remedy these conditions. Whatever your particular concern or overall goal is for your facial rejuvenation, we can help you decide which treatments are best for you based on your needs, budget, and lifestyle. At Celibre Medical, we believe in taking an individualized approach to facial rejuvenation that puts you at the center of all that we do.